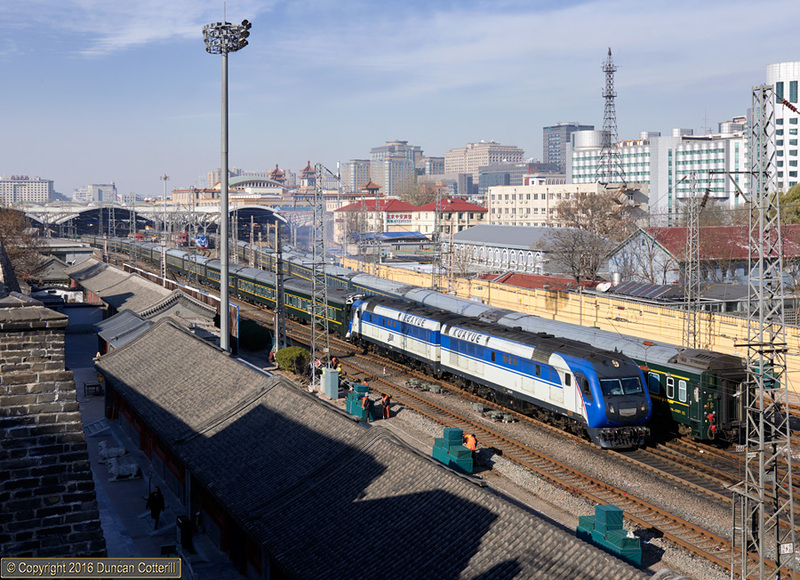 DF11G 0007 and 0008 set off from Beijing with train Z205/Z208, the 18:38 from Changsha to Tianjin, on 23 November 2016. A few years ago it was common for diesels to haul passenger services for long distances under the wires as there was a shortage of electrics geared for express passenger speeds. That no longer seems to be the case. Rather unusually this train runs into Beijing from the south, changes locos and then heads south-east to Tianjin. This strange routing is probably due to the shortage of rolling stock servicing facilities in the Beijing area rather than any passenger requirement.